The Z Huis tiny home has an outdoorsy spin: one of the two sleeping lofts is accessed via a rock wall. 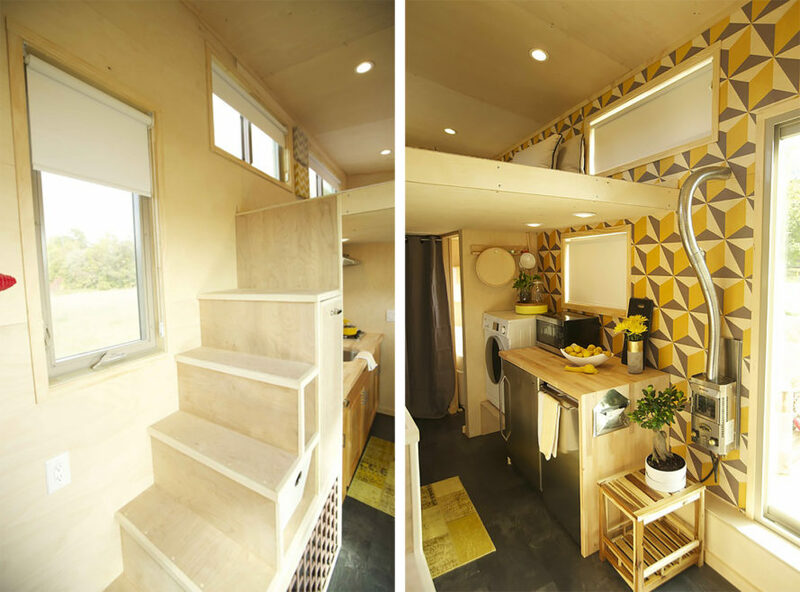 This 204-square-foot tiny house designed by Wishbone Tiny Homes is not only fun but functional, and it has the option to go off-grid. 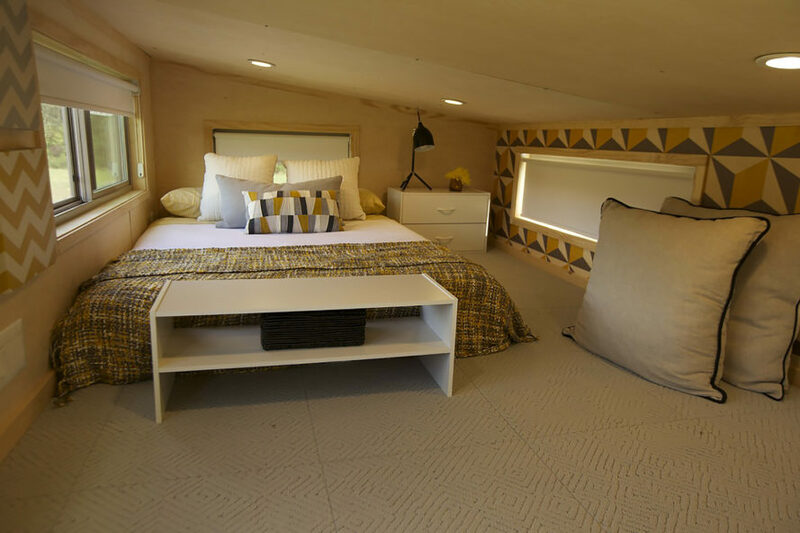 TV cable network FYI featured the home on their show Tiny House Nation - take a look after the jump. Vince Sorgentoni and Sam Adams had the house built mainly to pursue living with less of a carbon footprint, which they achieve in part with rooftop solar panels and a compost toilet. Their innovative design includes a sunken living area, full kitchen, sleek bathroom, and two sleeping lofts. Hidden storage, like a dog crate under a set of stairs, can be found throughout the Z Huis, which rests on an RV platform. 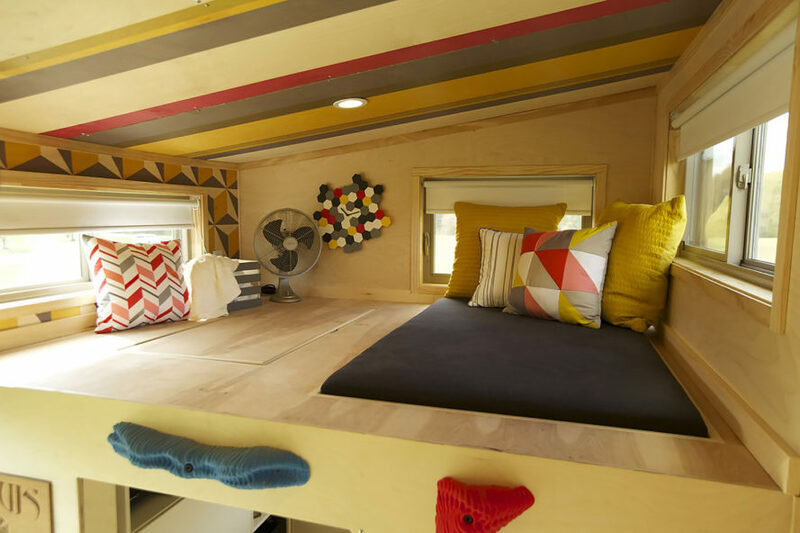 The couple wanted the home to reflect their love of the outdoors and rock climbing, and the rock wall allowed them to put a funky, personal spin on the tiny home. Sorgentoni and Adams resided in the home in New Jersey for close to a year. Because the Z Huis is on wheels, it was actually registered as a vehicle with the DMV. The home is 13 feet and five inches tall, just an inch shorter than New Jersey’s mobile home height limit of 13 feet and six inches. According to Tiny House Town, Z Huis models are available from Wishbone Tiny Homes for between $65,000 and $75,000. The company can have them ready in as fast as seven days. The rock wall reflects the couple's love of rock climbing. Couple Vince Sorgentoni and Sam Adams lived in the home for close to a year. Hidden storage, like a dog crate beneath the stairs, can be found throughout the Z Huis. The Z Huis features a full kitchen. The home has two sleeping lofts. The tiny house is 204 square feet in sum. A sleek bathroom and sunken living room make the adorable home totally comfortable. Rooftop solar panels and a compost toilet mean less of a carbon footprint for Z Huis inhabitants.